We were asked to be part of a really great project in 2014 in the recording of the Magnificent Missouri Vol. 1 compilation. In their own words, Magnificent Missouri, “organizes fundraising events in the greater St. Louis area to benefit conservation and environmental groups throughout Missouri.” One major project “Mag. MO” is involved in, is preserving the Katy Trail and protecting nearby lands from large developments. The album features Al Holliday & The East Side Rhythm Band’s cover of Taj Mahal’s classic “She Caught The Katy (and Left Me a Mule to Ride)” only found on this disc! For more information, visit www.magnificentmissouri.org . “There is nothing like music to connect people. Missouri is a state with great natural resources and a beautiful landscape that needs to be treasured and conserved. And we’re telling others in song! 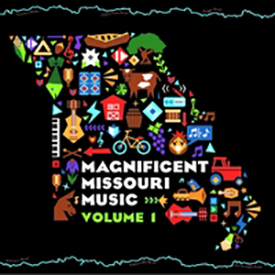 Our compilation CD (and accompanying album) — Magnificent Missouri Music, Volume 1 — includes original music by Missouri and Midwest bands and performers. All proceeds from sales of Magnificent Missouri Music, Volume 1 go to Magnificent Missouri to educate people about conservation issues. Missouri is rivers – big, powerful and muddy – small, meandering and crystal clear. Missouri is prairies, wild flowers and Ozark forests. Missouri is hillside cattle pastures, vast river bottoms and fields planted in corn, soybeans, cotton and rice and abundant vineyards. Missouri is scenic glades, pure springs, breathtaking bluffs and wetland homes for ducks, geese and other wildlife.